On Monday it was my birthday, and my Mam lets me decide what we have for supper. I choose roast chicken and Yorkshire pudding. Most people think it is a weird combination as it is usual to have yorkshires with beef but I love it with chicken and it really is very nice nice. I know this is a baking blog and doing a roast is cooking but I really wanted to put it on here. I have never made a roast before so this was my first attempt at cooking a roast supper. There was lots to do and get the timings right but I enjoyed it making a big meal. I liked the way that you put oil on the chicken before it goes in the oven, and then every 15 minutes you take it out and get the oil that is in the tray and pour it over the chicken and this makes the chicken moist and the skin crispy. Doing the potatoes was fun and they were very crunchy. First I peeled them and then boiled them for a little while whilst the oil was warming up in the oven. Then once the potatoes were half boiled I drained them and put them in the tray of hot oil in the oven. For vegetables I cooked broccoli, carrots and mashed swede and carrot. 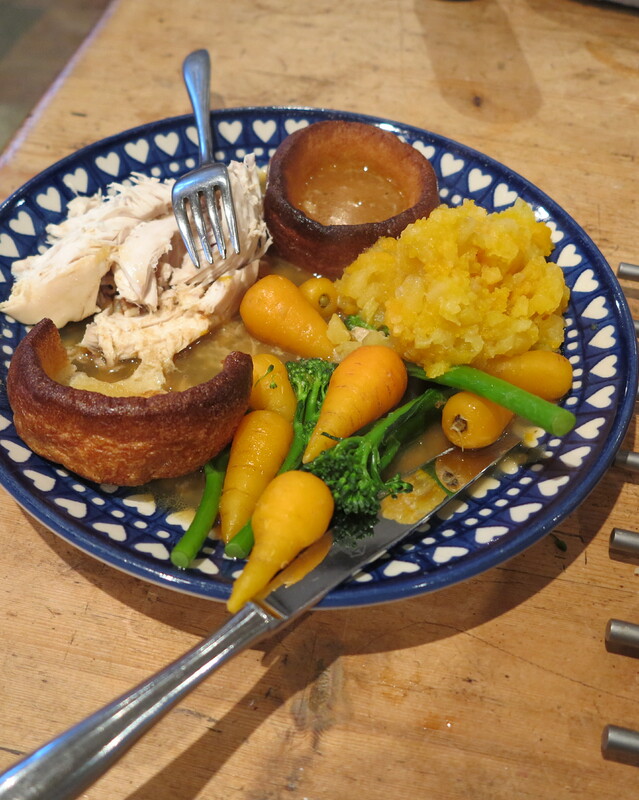 Then to finish off we I made gravy using the juices from the meat and the water that the vegetables where cooked in. Yorkshire pudding is made from the same mixture as pancakes the difference is they are cooked in the oven and not a frying pan. Your Roast dinner looks very inviting ,it certainly didn’t look like a first attempt you have cooked and presented it very well ,you should be extreamly pleased with yourself and made your mam proud .